The month of April 2018 in Armenia was marked by an unprecedented level of popular mobilization demanding the resignation of Prime-minister Serzh Sargsyan and the end of the corrupt system he enabled as President over the last decade. He announced his resignation on April 23, following 11 days of protests in Yerevan and other major Armenian cities. By May, the “Velvet Revolution” had catapulted to power. Armenia’s case is a clear evidence of the domestic desire for democracy of the societies of the South Caucasus and the steps they are ready to take when these dreams are not fulfilled, neither by their leaders nor international partners. 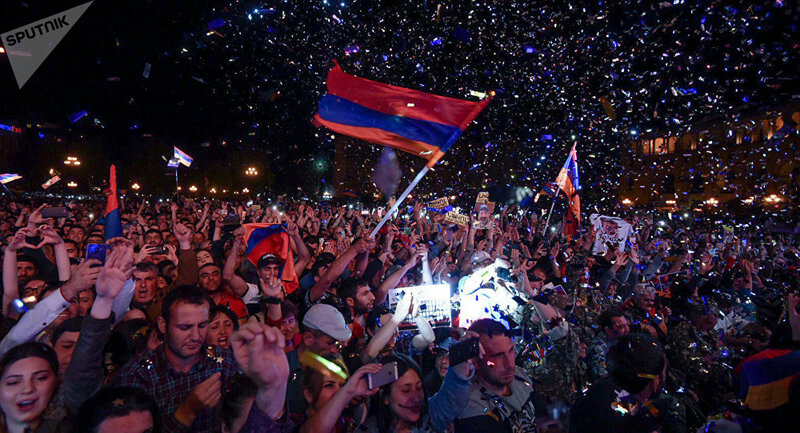 What role is there for Western institutions and countries’ democracy promotion policies in Armenia, after years of acceptance and legitimation of a regime that is now removed by popular protests? Although Armenia needs this international cooperation, due to the important economic, financial and political capital its provides the country, a qualitative shift is in order, as a means to respond to the popular demands for democracy. The failed transition from Soviet rule to democracy has been hidden behind the urgency of managing the ongoing conflict with Azerbaijan over Nagorno-Karabakh and difficult relations with Turkey. The perception of regional isolation and a sense of historical grievance has helped to make limited political gains more acceptable to ordinary citizens. But a new generation of Armenians, who have not experienced the war and who were born in an independent Armenia have different dreams of what democracy should mean and what the future of Armenia should look like. The challenge for international partners is, as in other contexts, to understand to what extent this younger population can become the barometer for the definition of their democracy support policies. Or, whether an older and established elite will remain their main interlocutor. Democracy promotion policies supported by Armenia’s partners, including the EU and the US, have been sensible to the difficult geopolitical context of the South Caucasus. This has meant in practice that stability has been privileged over significant changes in political management. The EU’s latest confirmation of this reading was the focus on the principle of differentiation, which the revised European Neighbourhood Policy privileged. Despite the recurrent underperformance of the Armenian government even in maintaining the most superficial aspects of democracy, the EU still perceived it to be wise to celebrate a new political agreement with the country. To be fair, the EU does prefer a policy of engagement over negative sanctioning by curtailing relations. However, a policy of “business as usual” left the EU’s interests unguarded and many disappointed in its lack of commitment to genuine democratic practices (as had been the case in Azerbaijan earlier in 2003). Moreover, after more than ten years of engagement with Armenia, the EU, a bulwark of democratic values, has little to show for in terms of achievements. The protestors’ demands for a more democratic system that redistributes wealth and builds a fairer society, despite the country’s difficult regional setting, shows that there is home-grown demand for democracy – which is often portrayed as lacking in many authoritarian settings. Armenia’s hybrid regime once more showed that what is perhaps lacking is a willingness by international partners to acknowledge local societies as the most valid interlocutors, rather than just their governments. Finding a system for horizontal dialogue across societies — that is respectful of each country’s sovereignty and legitimate institutions, but still provides the means for multiple views to be expressed — is the best way to keep international partners democracy promotion policies in shape. In the absence of such an approach, western-promoted democracy will be reduced to a geopolitical reading that is concerned with opening markets and power balance games. Such a view may work among elites who play this high level game, but it is profoundly disconnected from the daily challenges of ordinary citizens. The current international context has shown that citizens are still willing to put up fights and to claim institutions back. International partners need to be aware of this possibility and make their own decisions wisely.